According to Gilding, the coming decades will see loss, suffering, and conflict as our planetary overdraft is paid; however, they will also bring out the best humanity can offer: compassion, innovation, resilience, and adaptability. Gilding says we must fight-and win-what he calls The One Degree War to prevent catastrophic warming of the earth. He believes the crisis offers us a chance to replace our addiction to growth with an ethic of sustainability, and an unmatched business opportunity as old industries collapse and new companies reshape our economy. In the aftermath of the Great Disruption, we will measure “growth” not by quantity of stuff but quality of life. PAUL GILDING is an independent writer, advisor and advocate for action on climate change and sustainability. He has been involved with and led activist campaigns on a wide variety of social and environmental issues and served as Executive Director, Greenpeace Australia and Greenpeace International. Gilding founded Ecos Corporation in 1995, consulting to some of the world’s largest corporations on issues of sustainability until its sale in 2008. 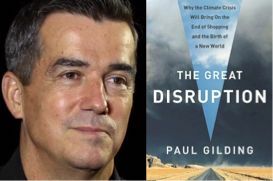 His first book is THE GREAT DISRUPTION: Why the Climate Crisis will Bring on the End of Shopping and the Birth of a New World. Dr. Vandana Shiva is a physicist, ecologist, activist, editor, and author of many books. In India she has established Navdanya, a movement for biodiversity conservation and farmers` rights. She directs the Research Foundation for Science, Technology and Natural Resource Policy. 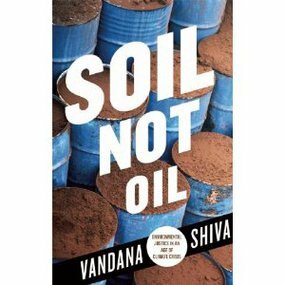 Her books include Biopiracy: The Plunder of Nature and Knowledge, Stolen Harvest: The Hijacking of the Global Food Supply, and her newest, Soil Not Oil: Environmental Justice in an Age of Climate Crisis. Shiva has been awarded several awards for her efforts including the Right Livelihood Award and the United Nations Environment Program [UNEP] Global 500 Award in 1993, and most recently the 2010 City of Sydney Peace Prize. We're hearing a lot about the trouble Europe is in. 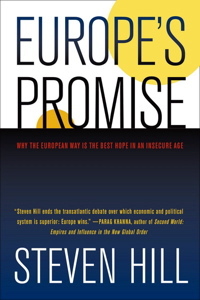 The debt crisis in Greece, and perhaps Spain, Portugal, and Italy, is threatening the Euro and the European Union. What's really going on? How did it happen? How bad is it? How will they deal with it? And what does it mean for the rest of the world and for the US in particular? We'll deal with those issues this Sunday, but that's not all. While the bad news of this Euro crisis makes headlines in the US, a quiet and successful revolution taking place in Europe does not. Europe seems to be finding a way to make capitalism and democracy work for people, not just for corporations. I think this is a critical unreported story in terms of its potential impact. Here's just a few things you may not have heard about. The European Union, 27 member nations with a half billion people, has become the largest, wealthiest trading bloc in the world, producing nearly a third of the world's economy - nearly as large as the U.S. and China combined. Europe has more Fortune 500 companies than either the US, China or Japan. European nations are rated by the World Health Organization as having the best health care systems in the world. Yet they spend far less than the United States for universal coverage, even as U.S. health care is ranked 37th. Europe leads in confronting global climate change with renewable energy technologies like solar and wind power, conservation and "green design," creating hundreds of thousands of new jobs in the process. Consequently, Europe's ecological "footprint" (the amount of the earth's capacity that a population consumes) is about half that of the United States for the same standard of living. 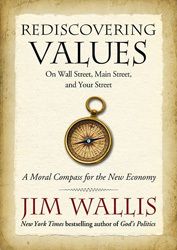 JIM WALLIS Founder/President, Sojourners; editor, Sojourners magazine; Author, GOD'S POLITICS; THE GREAT AWAKENING; and his newest, REDISCOVERING VALUES on Wall Street, Main Street, and Your Street: A Moral Compass for the New Economy. · Spending money we don't have for things we don't need is a bad foundation for an economy or a family. · Care for the poor is not just a moral duty, but is critical for the common good. · A healthy society is a balanced society in which markets, the government, and our communities all play a role. It is my privilege to have Latin America's most acclaimed writers, EDUARDO GALEANO. I confess I was not aware of him until Hugo Chavez presented Barack Obama with one of his books. For that introduction, I thank the Venzuelan President. GALEANO's works are a unique blend of history, fiction, journalism and political analysis, and his life is so much more than that. Born in Uruguay in 1940, EDUARDO GALEANO began writing newspaper articles as a teenager, by the age of 20 he became Editor-in-Chief of LaMarcha. A few years later, he took the top post at Montevideo's daily newspaper Epocha. 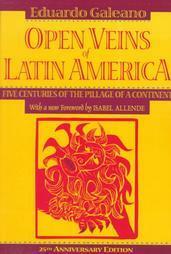 At 31, he wrote his most famous book - Chavez gift -- The Open Veins Of Latin America: Five Centuries Of The Pillage Of A Continent. After the 1973 military coup in Uruguay, GALEANO was imprisoned and forced to leave the country. He settled in Argentina where he founded and edited a cultural magazine, Crisis. After the 1976 military coup there, he moved to Spain where he began his classic work Memory of Fire, a three-volume narrative of the history of America, North and South. He eventually returned home to his native Uruguay where he now lives.